The black Airport Commuter Backpack from Think Tank is larger than Think Tank's Airport Essentials Backpack and is sized to hold a pro size DSLR, 4-6 standard zooms, your iPad and 15" laptop. The extra space this bag provides allows you to take along your 400mm f/2.8 attached to the camera body or your 500mm f/4 unattached. Your gear is nested within the supplied padded dividers in any configuration you choose while your computers are tucked safely away in their own separate, zippered lockable compartment. Overall, the pack is designed for maximum efficiency and portability and meets the needs of the pro shooter who needs a quick access pack that both travels well and is secure. The exterior is made from a combination of ballistic nylon and polyurethane for strength and water resistance while the inside is nylon with padded closed cell foam dividers. For security, the pack comes with a security cable and lock that can be tied to any solid object such as a reception hall column or fence. This allows you to remove gear knowing that the rest of the pack will remain where you leave it. The strong YKK zippers on the pack can also be locked with user-supplied locks for even more peace of mind. As part of Think Tank's Airport series, the Airport Commuter makes your traveling life easy and comfortable. There are carry handles on three sides and the adjustable harness comes with beefed up lumbar support and Air Mesh paneling to keep your back cool while on the march. For sheer convenience, the adjustable shoulder straps even have elastic pockets for your iPhone or business cards. The waist belt is removable and can accept Think Tank's optional Pro Speed Belt or Thin Skin Belt that will make portability more comfortable as well as increase your load capacity. Inside, the main flap has see-through laminated mesh pockets for storing everything from memory cards to snacks. For marginal weather, the pack comes with an easily deployed rain cover. The tripod mounting system places the feet in a side pocket and the head secured with an included strap. While you're on the move, use the side water bottle pocket for instant refreshment without having to stop, remove the entire pack and retrieve liquid. And, when you're at the airport, the top zippered pocket is the perfect place to store your passport. It may not look like your traditional photo backpack but it sure works like one. With its immense capacity, ease of use and security features, the Airport Commuter is a pack to be reckoned with. It's backed by Think Tank's lifetime warranty against manufacturer's defects. 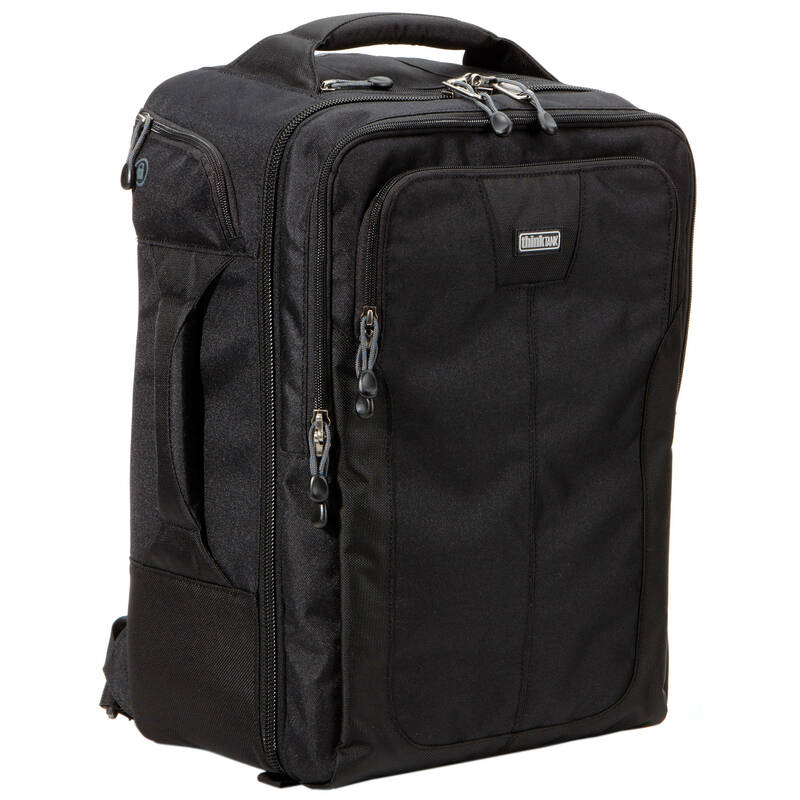 Box Dimensions (LxWxH) 19.2 x 13.2 x 11.3"
Airport Commuter Backpack (Black) is rated 4.8 out of 5 by 73. Rated 5 out of 5 by Indianscout from Perfect for traveling through airports.. The name says it all. I picked this bag to take my photography gear to Calgary, Canada. It made it through customs, on a connecting flight on a small aircraft under the seat (the flight was full and all the overhead space was taken) and then on a 737 in the overhead. Now, I'm retiring my old bags and using this one full time. It carries a DX1, a Canon 200 mm fixed, a Canon 70-200 mm zoom, two other smaller lenses, and all of the accessories. The padding is soft yet also stiff enough so nothing slips around on the inside. I also put an iPad 3 and a MacBook Pro in it. This is an awesome bag. Rated 4 out of 5 by AngryNikonFan from Nice strong bag, awful tripod holder This is the perfect size bag for travel as it is the correct size for major airlines, and the padding is comfortable to a point. My purpose for this is to serve more of an all around bag for taking my gear to and from events when a shoulder bag just won't do, road trips, hiking, etc. and occasional air travel. In that regard it works. What I absolutely can't stand about it is why the tripod holder is not in the middle but the side. A pro tripod is easily 6-7 pounds with the head and it just makes the entire bag feel awkward and off balance. To make things worse, there were no directions included in how to tie the straps so I had to youtube other ThinkTank bags. Rated 5 out of 5 by Mr. Magoo from Excellent for carrying a lot of gear I am using it to haul three Nikon DX DSLR cameras + 70-200/4, 300/4 (with 1.4 extender), 16-85, and 85/1.8 lenses, hoods and misc. accessories, plus a MacBook Air in the front pocket, on a safari this summer. It all fits with room to spare. I can even comfortably fit the three bodies, each with a lens mounted, with the 85 lens in a separate pocket. If that does not tell you how much space this has, I don't know what will. The only downside is that it is large enough to hold all that aforementioned gear. Meaning, if you don't need to store or haul so much stuff, check out B&H's selection of smaller models from this manufacturer. Rated 5 out of 5 by Careful Carl from To Kenya & back Through airports & on and off Land Rovers on safari, this Think Tank backpack served me well. It fit the airplane overhead bin easily and was very accessible in the Land Rover. It is now my go to travel and local use carrier. I was at the airline weight limit for a carry-on with a Nikon D300, 5 lenses (70-200mm 2.8 being the largest) plus tele connector, recharger, etc. The iPad took it over the weight limit, but size-wise it would also take a 15 inch laptop as well as iPad if you want to gamble on an extra airline fee. 20 pounds was enough for me to manage as a 75 year old. Rated 5 out of 5 by Ben from Perfect for international travel I got this backpack for an international trip due to carry-on weight restrictions. I had a rolling backpack which weighed 11 pounds. This one weighs 4 pounds. It will hold an unmounted 500mm f4 lens with no difficulty as well as two camera bodies and other prime lenses limited only by the airline weight restrictions. It also will accommodate my 15 laptop in a convenient pouch. The pack is well made with an assortment of pockets to hold batteries, memory cards, etc. Some back packs have straps that flop all over the place. Not this one. I was very pleased with this product and would highly recommend it. Rated 4 out of 5 by Pu from A light backpack for travel I have a Lowepro Pro Trekker AW II which I can put everything I need in it, including a 500mm f4 with 7D attached, a 300m f4 and 5DIII. The problem is the bag is too heavy and can not pass carry on baggage weight limit. Airport Commuter from Think Tank is just right for this kind of flight. I can put the 500mm f4 and 2 camera bodies in there and the weight is just right under 22lb. The Backpack is well build as always from Think Tank and comfortable if need to carry for long time. I wish it was 1.5 longer so that 500mm with body attached could fit in it. Rated 5 out of 5 by Steve from A nice revision I have an older version of this backpack. I purchased this one as a replacement for another brand so that my wife and I can share two similar packs. The older one has been an excellent travel companion. With more depth and an vastly improved computer pocket this pack will fill the bill for travel with all the photo gear we need for an extended trip. So we have now sold our other brand packs (much more cumbersome to carry and stow) in favor of having these. Weight for travel is a significant consideration, and this pack is much lighter than our others of similar size and carrying capacity. Rated 5 out of 5 by Jacko from great for air travel I did a lot of research into which camera bag to buy. I even walked into the B&H Superstore twice to inspect the various options in their showroom. My must-have's: - laptop slot and tripod strap - must fit within official airline carry-on size limits (e.g. American Airlines: 56 x 36 x 23 cm) - must be deep enough to hold a pro dSLR with battery pack attached (I plan to upgrade my gear in the near future). - must have enough space to hold all my photo gear plus essential travel accessories that I don't want to put into checked luggage, such as charging cables, an emergency set of clothing and toiletries (just in case my checked luggage gets lost), travel documents, etc. The main competitors in my closer selection were the Lowepro Pro Runner 350 AW Backpack and the Tamrac Expedition 6x Backpack. The Lowepro Pro Runner 350 AW is not deep enough to hold a Nikon D800 with even just a tripod clamp attached, so this was easily eliminated. The Tamrac Expedition 6x is more expensive, and the curved top takes away valuable space. Also, the external dimension of that bag is deeper than what is allowed for carry-on bags. The Think Tank Airport Commuter perfectly fits within carry-on limits, yet it is still quite deep inside. It weighs less than the two alternatives listed above. The bag easily holds my Nikon D90, 70-200mm F2.8, 14-24mm F2.8 (the bag is deep enough to allow this lens to fit in vertically), 18-200mm DX, two small prime lenses, and there is still enough space to hold a 24-70mm F2.8 (if I ever buy one) and an additional FX body with battery pack attached. The bag has a laptop slot which easily holds my Lenovo Thinkpad 410s (14-inch screen), and it has an additional ipad slot. It comes with a generous supply of movable dividers, many more than you are likely to use. And it comes with a rain cover, and a security cable with combination lock. The security cable is quite thin and is more a nuissance than a real obstacle for someone trying to steal your bag. In comparison to the two alternative backpacks listed above, the padding of this backpack is somewhat thin and flimsy, but I feel it is still sufficient to provide adequate protection. The advantage is that the thin padding maximizes the available interior space. Another nice aspect is that the bag is not immediately recognizable as a camera bag. It looks more like a business-traveler carry-on trolley that happens to be a backpack. The bag may be too big for walking around in a major city all day, but if used for traveling, especially by air, it is the perfect choice. I'm looking for a bag that does the following and am having a hard time finding exactly what I want. A. I need it to fit on a plane at least in the overhead. I have priority boarding on most flights due to miles etc so not worried about having to store it below but would like it to lock. B I would like it to be able to hold the following: 2 x D810 w/ battery grips, 200-500 f5.6, 80-200 f2.8, 50 f1.4, 105 f2.8, 16-35 f4, and a tablet and laptop as well as batteries and assorted extra gear like remotes, filters etc. Can this bag do that? I'm currently in a Ruggard Thunderhead 75 and it just feels too big. The exterior ability to hold a tripod is nice but not essential as I probably won't bring it on the plane but rather check in a bag. Am I looking at the right bag or no?Thanks for your help fellow travelers. The Airport Commuter bag fits under a seat so it will fit in the overhead. I think two D810s with battery grips and the large lens will be too much, but you might look into the the larger airport bag from Think Tank. They make really good products and I have been very happy with the bag and the belt system and a variety of pouches. Before buying I went to B&amp;H and they were VERY helpful in reviewing the products and helping me decide. I have both the Airport Essentials and the Airport Commuter backpacks. My 15 MacBook Pro fits in both. I prefer the Essentials as the Commuter bag is a little too big. Anyone else have problems setting the lock on this bag? I know it says to press hard, and set it on the table and use body weight, but it won't budge. I'm beginning to think its a bad lock. I have had no problems with the lock. You know that you press in after setting the combo, right? I'm looking for a bag that I can use for the occasional hiking, shooting street events, or covering an indoor event where I want to have all my stuff together, but noticed many of them (like the Manfrotto) are more than 9 inches tall and thus may not be used as a carry on for the times that I want to travel. By the name and the dimensions, this bag seems perfect for airport, but is there any issues if it were used for hiking and event photography? My hikes wouldn't take longer than 2 or 3 hours so it's not like I'd be going on day long hikes where comfort is essential, but I wouldn't want my bag to fall apart either! The Think Tank Photo Airport Commuter Backpack is carry on compatible. Most airlines require carry-on items to have an external linear measurement that is equal to or less than 45.0 (114.3 cm). The external dimensions of this case add up to 39.0 (99.1 cm) In my opinion it is a comfortable bag and it is suitable for wearing all day on a hike. You can also use it for event photography, street photography or pretty much any style of photography. Does this pack have wheel? No Wheels as others have said. Just used it on a trip to Disney, worked out great. Will this bag hold the Tamron 150-600 either attached or loose? I am not sure but it does hold my Nikon 500mm lens. Will the bag fit in the overhead compartment in a CRJ jet? Yes, barely, but I had to remove the laptop computer from the front pocket to fit in the overhead bin of a CRJ-200 (ExpressJet DBA Delta Connection for Delta Airlines). I measured the bin with a tape measure and found the opening to be 9 tall and the interior of the bin to be 10 tall x 15 deep. Once I squeezed the bag through the opening it was fine. It has also fit in the overhead bins of the ERJ-145 and ERJ-175. I know that the Think Tank Airport Commuter is designed for carry-on. However Does it fit not he commuter planes like the Embraer 175? I can't imagine it fits in the overhead, but would it fit underneath the seat in front? Yes, the Airport Commuter Backpack fits in the overhead bins of the ERJ-145 and ERJ-175.The opening of the ERJ-145 overhead bin is 9.75 tall and the interior of the bin is tapered from 11 tall to 6.5 tall and is 14.5 deep.The opening of the ERJ-175 bin is 11 tall and the interior is 11 tall and 16 deep.This bag will barely fit in the overhead bin of a CRJ-200 if you remove the laptop or tablet from the front pocket. The bin opening is 9 tall and the interior is 10 tall by 15 deep.